BBC NEWS | UK | Magazine | Why do CAPITAL LETTERS so annoy us? Why do CAPITAL LETTERS so annoy us? A New Zealand woman has lost her accounting job after sending "confrontational" e-mails filled with block capitals. So why is it taboo to hit the caps-lock key? "TO ENSURE YOUR STAFF CLAIM IS PROCESSED AND PAID, PLEASE DO FOLLOW THE BELOW CHECK LIST." The actual words may seem harmless enough, but their appearance ultimately contributed to the firing of ProCare Health worker Vicki Walker in Auckland. It was one of a number of e-mails that her employer claimed, at a tribunal, had spread disharmony at work. Some also "provocatively" contained highlighted phrases in bold or red, the tribunal heard. Most web users know capital letters are a capital offence - they're commonly thought to be online shorthand for screaming. But how did they get this reputation? Historically, capped letters portrayed a certain formality, says Paul Luna, director of the department of typography and graphic communication at the University of Reading. "They're associated with things like Roman inscriptions and the formal presentation of text," he says. "They have a certain sort of architectural quality." The forum in ancient Rome, for instance, showcased the emperors' great deeds written in capital letters. While capitals were reserved for the best and the greatest, lowercase letters in the Latin alphabet - which English is based on - developed as a faster way to write, says Mr Luna. And over time, capitals have become a way to set text apart - whether to articulate the beginning of a new sentence or to mark a major heading in a book. While they were sometimes used for emphasis, typographers typically didn't like the look of the dense text blocks that make the page appear grey, says Mr Luna. In the print-based world, other options, like bold and italics, became more common, leaving capital letters for proper nouns and sentence beginnings. But the internet changed all that, he says. The high resolution of a printed page is enough to make bold and italics stand out, but the lower quality of a screen often requires people to revert to the caps-lock key to make a point. And while printing houses and publishing companies have traditionally regulated the use of capitalisation, the web is a bit of a free-for-all, says Martin Manser, author of the Good Word Guide. "The thing about e-mail is that there's no particular etiquette. The whole thing is more fluid," he says. "In written letters, there are definite conventions that are right or wrong." Ultimately, in the rushed world of online communication, all-caps has become a bit of a "lazy" shorthand for yelling - it's faster than finding another way to convey excitement or agitation. But the recipient feels like they are being shouted at. And is there also a physical reason? Are all of those rectangular letters hard on the eyes? Some studies say yes - indicating that people read by recognizing the shapes of letters within words and that the lowercase versions have more shape differentiations than block capitals. But Mr Luna says this is "nonsense" - pointing to new research that has found capitals and lower-case letters make no real difference. Instead, the caps-lock key has become a tool for writers. "It's a great aid to articulating a message, really," he says. And if that means the occasional CAPITAL e-mail, then so be it. It's Mr Luna who is talking the nonsense if he doesn't recognise that blocks of text in all capitals are far harder to read. I've done some "new research" myself and confirmed this. GOT THAT? Good. Of course we normally understand block letters as either yelling or emphasis. But when I get an e-mail which is only written in uppercase, it means somebody just couldn't be bothered to hit the caps key and write as a normal human being...yet, it doesn't mean that they are being confrontational, does it? Perhaps it shows lack of awareness of the shared conventions regarding e-mails (and text messages). Personally, I tend to do the exact opposite...i only use lower case, which can be annoying i know. but hardly rude. I am a moderator for a large discussion group on Facebook, and one of main complaints we receive about members of the group is the use of capitals in their posts. It comes across as aggressive and shouting. We have had to institute a protocol whereby (ENS) is posted if someone is to use capitalisation, in order that it is known they are emphasising not shouting at other members. 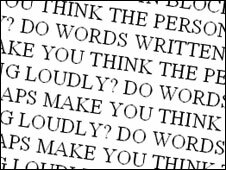 To use capitals can trigger aggressive responses and is seen as provocative in netiquette. Of course it's ok to write in CAPITAL letters whether on e-mails, letters or text messages on mobiles. A bigger problem is today's written garbage called txt messaging ie: ur for you are, m8 for mate etc. I once received a "txt" message from a friend and thought their youngest had been sent it. But no it was from my friend and it took all of 10 minutes to decipher - just to save time for her it wasted my time reading it, at the end of the day it's A PERSONAL DECISION. I have worked with type for over 20 years and although "all caps" is perceived as shouting, there is a more fundamental reason for not using caps lock. If anything but basic sans-serif (Arial) and serif (Times) fonts are used for text, words do become harder to read. Sorry Mr Luna, you're wrong - try reading a paragraph of Old English or any script face in caps and you will see it is almost impossible to read. Typography is a craft that is often abused. E-mails - well, we all get too many of those anyway. It's far, far easier to read lower case letters, which have ascenders and descenders (the line going up in a "d" or down in a "q"). All-caps present all the letters in nearly the same sized blocks. I am a computer programmer, and one thing I hate to see when I am looking over someone else's code is to have it all capitalized. (It may have been the standard in the 20th Century, who knows.) If I take over the maintenance of some code, I'll quite often highlight all the text and change it to lower case, then go through and capitalize the appropriate spots.